Grasp and retain the fundamentals of medical terminology quickly and easily Don't know a carcinoma from a hematoma? This friendly guide explains how the easiest way to remember unfamiliar, often-tongue-twisting words is to learn their parts: the prefix, root, and suffix. 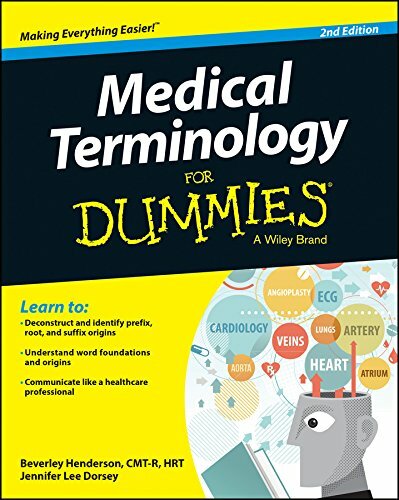 Medical Terminology For Dummies breaks down the words you'll encounter in your medical terminology course and gives you plain-English explanations and examples to help you master definitions, pronunciations, and applications across all medical fields. For many, the language of medicine and healthcare can be confusing, and frequently presents the greatest challenge to students this guide was designed to help you overcome this problem with ease! Packed with ideas, study materials, quizzes, mind maps, and games to help you retain the information, Medical Terminology For Dummies quickly gets you up to speed on medical prefixes, suffixes, and root words so you'll approach even unfamiliar medical terms with confidence and ease. * Bone up on words that describe and are related to the body's systems * Correctly pronounce and understand the meanings of medical terms * Find tricks and study tips for memorizing words * Build your knowledge with helpful word-building activities If you're working toward a certification or degree in a medical or healthcare field, or if you're already on the job, Medical Terminology For Dummies is the fast and easy way to learn the lingo.